Script interface for Particle Systems (Shuriken). Shuriken is a powerful and versatile Particle System component. In script, these parameters are accessible through ParticleSystem.main. Every module has special multiplier properties that allow you to change the overall effect of a curve without having to edit the curve itself. These multiplier properties are all named after the curve they affect - for instance ParticleSystem.emission.rateMultiplier controls the overall effect of ParticleSystem.emission.rate in a given system. Parameters support a shorthand notation for simple constant values. To set a constant value for a parameter, all you need to do is assign a number to it. It is not necessary to create a MinMaxCurve or MinMaxGradient object in the ParticleSystemCurveMode.Constant mode. Performance note: When setting properties on particle modules, the settings are passed immediately into native code. This gives the best performance. This means that setting properties on a module struct doesn't set something in script that requires setting back to the Particle System; it all happens automatically. collision Script interface for the Particle System collision module. colorBySpeed Script interface for the Particle System color by lifetime module. colorOverLifetime Script interface for the Particle System color over lifetime module. customData Script interface for the Particle System Custom Data module. emission Script interface for the Particle System emission module. externalForces Script interface for the Particle System external forces module. forceOverLifetime Script interface for the Particle System force over lifetime module. inheritVelocity Script interface for the Particle System velocity inheritance module. isEmitting Determines whether the Particle System is emitting particles. A Particle System may stop emitting when its emission module has finished, it has been paused or if the system has been stopped using Stop with the StopEmitting flag. Resume emitting by calling Play. isPaused Determines whether the Particle System is paused. isPlaying Determines whether the Particle System is playing. isStopped Determines whether the Particle System is stopped. lights Script interface for the Particle System Lights module. limitVelocityOverLifetime Script interface for the Particle System Limit Velocity over Lifetime module. main Access the main Particle System settings. noise Script interface for the Particle System Noise module. proceduralSimulationSupported Does this system support Procedural Simulation? randomSeed Override the random seed used for the Particle System emission. rotationBySpeed Script interface for the Particle System Rotation by Speed module. 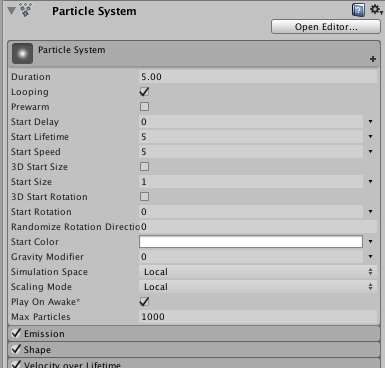 rotationOverLifetime Script interface for the Particle System Rotation over Lifetime module. shape Script interface for the Particle System Shape module. sizeBySpeed Script interface for the Particle System Size by Speed module. sizeOverLifetime Script interface for the Particle System Size over Lifetime module. subEmitters Script interface for the Particle System Sub Emitters module. textureSheetAnimation Script interface for the Particle System Texture Sheet Animation module. trails Script interface for the Particle System Trails module. trigger Script interface for the Particle System Trigger module. useAutoRandomSeed Controls whether the Particle System uses an automatically-generated random number to seed the random number generator. velocityOverLifetime Script interface for the Particle System Velocity over Lifetime module. Clear Remove all particles in the Particle System. GetCustomParticleData Get a stream of custom per-particle data. GetParticles Gets the particles of this Particle System. IsAlive Does the Particle System contain any live particles, or will it produce more? Pause Pauses the system so no new particles are emitted and the existing particles are not updated. Play Starts the Particle System. SetCustomParticleData Set a stream of custom per-particle data. SetParticles Sets the particles of this Particle System. Simulate Fast-forwards the Particle System by simulating particles over the given period of time, then pauses it. Stop Stops playing the Particle System using the supplied stop behaviour. TriggerSubEmitter Triggers the specified sub emitter on all particles of the Particle System.